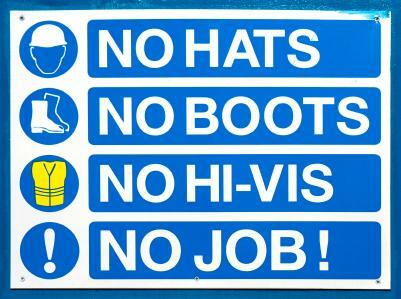 While safety in the workplace is no laughing matter, teaching your employees to be safe at work can be. If you make your safety training fun, interesting and engaging, your employees are more likely to remember what they have learned and put it into practice every day. Safety training will be different in an office than in a warehouse or factory, but all employees will benefit from knowing how to stay safe. When you design a workplace training program, make sure it teaches both company policies as well as state and federal safety guidelines. Reward your employees for keeping their workplace safe with custom scratch-off cards that also stress a safety message. Distribute the cards as a reward for a long accident-free streak or as an on-the-spot prize for observed safe behavior. They also make great hand-outs for employees who answer questions correctly during safety training programs. 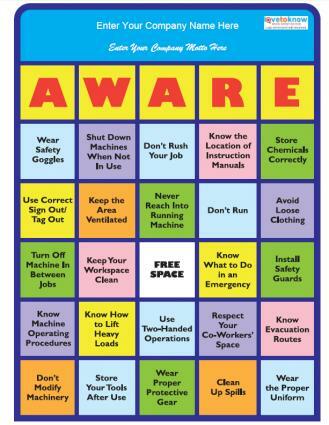 Get your entire workforce involved in being safe with Safety Bingo. Every employee gets a card filled with either traditional numbers or safety tips, pictures of equipment or other items relevant to the workplace. For every day the workplace is accident-free, announce another square and offer rewards for every "bingo." The game ends if there is an accident and employees start over with a new cards. Download LoveToKnow's customizable Safety Bingo cards by clicking the link to the right. If you need help downloading the printable, check out these helpful tips. If you want to reinforce previous safety training, create a scavenger hunt that tests workers' knowledge of the workplace, equipment and safety procedures. For example, challenge a team of office workers to walk through the correct steps for evacuating the building in case of a fire; at each station they collect a token and a full set of tokens in the correct order wins a prize. Keep your employees awake and engaged during safety training by getting them involved in the learning process. Instead of giving a boring lecture, challenge your employees to create songs or raps about a particular safety procedure and then perform them for co-workers. Tap employees to judge the performances and award prizes for songs that accurately present necessary information, which gives every group a chance to win. Give additional bonus awards for creativity or talent. In between your formal safety training programs, make employees the teachers while you test their safety knowledge. Give small groups of employees a video camera and a safety scenario and have them create and film a short movie that can be shown in the cafeteria, break room, or even sent via email to workers' computers. Pay the actors in prizes and give all employees the chance to work on a video over the course of several months. The video library can then be used for later training sessions. Creating a fun and interesting safety training program may require more time, effort and money up front, but the pay-offs are great. Compared to the costs of recovering from an accident - which can include physical injuries, OSHA fines, higher insurance rates and even damage to reputation - the price of some incentive prizes and games is minimal.